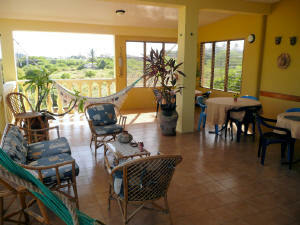 on a tropical island & have your property produce a steady income. If you were thinking of buying a house in the tropics this is for you. of visitors who come to Margarita Island each year. The reconstruction costs of this property would be almost triple the selling price. from beautiful Playa El Agua, a 4 KM. long white sand beach which is considered one of the most desirable in Venezuela. 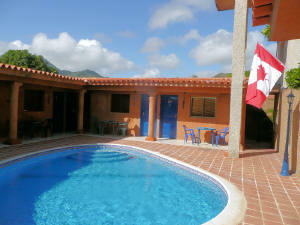 The challenging Margarita Island Golf Club is a 10 minute drive and the main city of Porlamar is a 30 minute drive. Most shopping needs can be met by the many shops in the immediate area. The construction was started around 1982 with the completion of the first floor while the second floor was finished in early 1989. 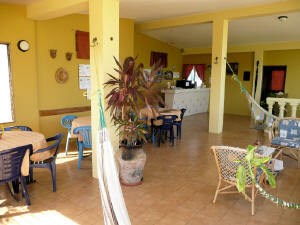 A major renovation was done between March & August, 2007 when a pool & 6 poolside rooms were added. The current owners purchased in June 1987.
and the guests on the upper floor & in the poolside rooms. The guests have their own entrance. There is a steady flow of regular clients as well as additional business generated by the Internet. The owners are now looking to retire (Dan is 73) and to have more time to pursue other interests. with a low maintenance earthen look plaster and topped with electric security fencing. There is also a 4 camera video system that automatically records all movement in front, pool area & upstairs patio. Across the front, the wall is finished in no maintenance colored river pebbles the same color as the house and topped with clay roof tiles. The gates and security bars are all no maintenance anodized aluminum. 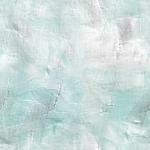 which has resulted in a beautiful no maintenance finish that will last for decades. No need for any more exterior painting! The driveway and all walking paths are reinforced poured concrete. The electrical system is 220 volt with 110 volt service on each floor. The dryer room, pool house & the 14 A/C's are wired for 220 volt service. 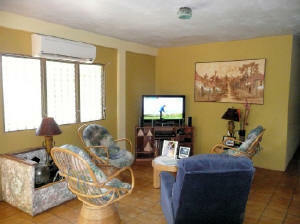 in the private living area have DirecTV. The master bedroom has an HD DVR. with the two water tanks the supply is more than adequate to serve the needs of the house. Water is supplied to the house from a gravity feed concrete rooftop tank of 11,000 L. while the ground tank is 70,000 L.
The windows throughout the house are Florida style aluminum jalousie. All sea - side security bars are no maintenance anodized aluminum. All floors are ceramic tile. 2 existing CANTV phone lines with DSL Internet connection will be included. Also included is our Face Book page with more than 32,200 fans. mahogany cabinetry with lots of counter and cupboard space. *Laundry Room: adjacent to the kitchen. 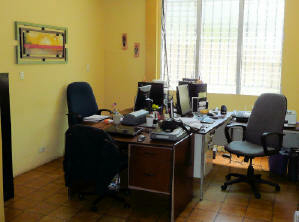 This room is currently being used as an office however it started out as the dining room. 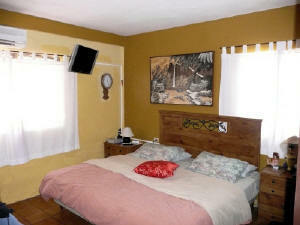 *Bedrooms: the master and 1 guest bedroom have a King Size bed and a full ensuite bathroom. that includes the dryer and a large freezer. It has built-in shelving and a large table. 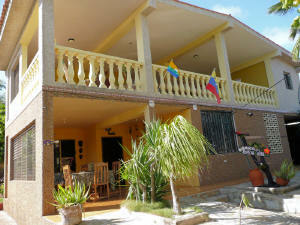 *Bedrooms: 4 bedrooms each with a complete ensuite bathroom, DirecTV, A/C & access to a fridge. All rooms have built in tables and closets. 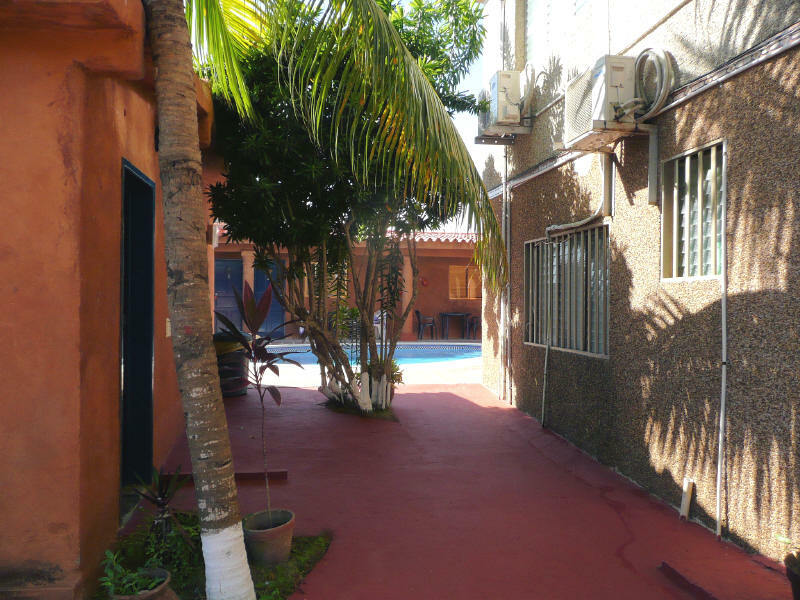 *Patio: approximately 60 m2 (650 sq. 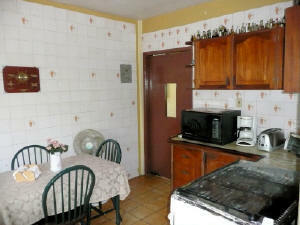 ft) with a wet bar & kitchen area. The railing is Roman style columns and the view is of the mountains and the sea. This is where breakfast is served each morning. *Storage Room: is off the patio and has a large built in closet and shelves. 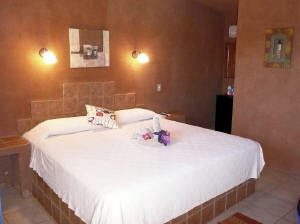 with king size beds, ensuite bathrooms with hot water showers, DirecTV. The pool is approx. 40,000 litres. & has a pool pump & pump for the upstairs water tank. There is also lots of storage space in the pump house. This is a well maintained home with many potential uses. There are no liens or mortgages attached to this property. Payment may be made in Bs. here in Venezuela or to our account in Canada.